Open 9 a.m. - 4 p.m. daily weather permitting. All rides will not operate if there is rain, snow, ice or if the temperature will not reach 50 degrees by 1 p.m.
Omaha's Henry Doorly Zoo and Aquarium members will receive a five-percent discount on their rides purchase by presenting their membership card and a valid photo I.D. Get an All-Day Attractions Pass for $21.95. 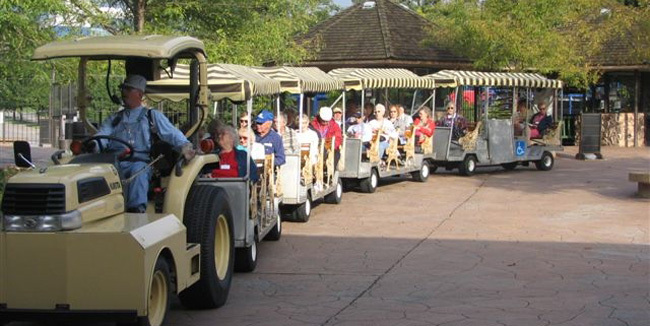 Includes Skyfari, Omaha Zoo Railroad, Tram, Sue's Wildlife Carousel and Stingray Beach. Budgie Encounter and Birds in Flight Program not included. All rides operate weather-permitting.